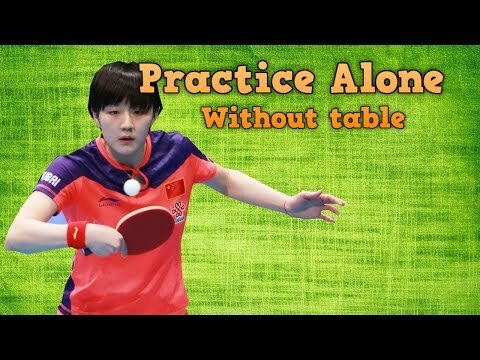 How to practice table tennis alone at home? If you don’t have any partner and want to self-training at home without a table, this tutorial is for you. I explain you the best way to solo practice. You will understand more about which muscle that the Chinese focus the most in table tennis training. “I don’t have a serious table tennis partner. Can you make a video on practicing alone as per Chinese philosophy”? Table tennis is the game of coordination. You need to move and to incorporate the movement of your body to make a stroke. That’s why you should train with the table and with a partner. For some reasons, that you want to practice alone. Practicing alone without the table will not improve your coordination. Doing the table tennis drills alone is boring. Without the table, you can’t play the normal shots as in a table tennis match. The “explosiveness” and the “precision”. Chinese philosophy about the physical training in table tennis focuses on the lower part of the body. The most important muscle groups are the back, the hip (waist) and the leg. Xu Xin has answered in the interview that, for him, the back muscle is the most important in table tennis. Learn the “Power From the Ground” concept in Chinese table tennis philosophy. You can see that this Chinese player is training the back and the hip muscle. His legs are kept fix. He uses mainly the hip to generate the power. Chinese philosophy considers the hip as the connection of the 2 body parts: lower part to generate power, and upper part to transfer the power. If you have to practice alone, you should focus on these muscles. The stronger these muscles are, the quicker you get into the position, and your strokes will be more powerful. Again, you can see that this player focuses on the muscle of the leg and the back. He holds the tool with his forearm, and then use the body to generate the power. His elbow is very close to the body. This training will increase the power of his forehand topspin attack because it shares the same stroke mechanism. And this training will improve the power of his backhand topspin far from the table. He focuses mainly on the rotation of the body. This is the way, the Chinese players add the power to all of the strokes. They focus on several muscle groups, the back, the hip, the abdomen. The forearm is the part of the upper limb between the elbow and the wrist. Because the backhand stroke is the quick stroke, so you should train also the forearm muscle. It’s like you take out the sword. This action will increase the explosiveness of your backhand close to the table. The first aspect you can practice alone without the table is the physical strength of the lower part of your body. The second aspect is the “explosiveness” and the “precision”. This is the best example of “explosiveness”. Many players focus only on pulling back the racket before hitting the ball but don’t know how to “accelerate” correctly. Look at this Chinese player. and suddenly generate a lot of power to the ball. It doesn’t come from his forearm, but it comes from the rotation of his body. Now you understand more what I’ve said in my previous videos: “Power from the ground. That’s your body (waist) will generate most of the power, the forearm is only a tool to transfer this power”. This is the secret of Chinese table tennis techniques, they found the way to increase the stroke power in the shorter amount of time. Because the waist muscle is much stronger and quicker than the forearm muscle. This Chinese player is indeed a very good player. His stroke is powerful and of course, his ball is very spinny and fast. Because “explosiveness” and “acceleration” is the main reason that makes the ball spin. Without the table, you can learn to hit the ball at the right timing. Not many players know that a table tennis stroke has 3 phases: slow (relax), acceleration (explode), and slow (recovery). This is the best way that our muscle compacts it’s energy and then release it suddenly. Look at this player, the explosiveness of his stroke is very good. It happens in a fraction of a second. If you do your stroke in a linear way, without “acceleration”, it’s not good. You should change it, do your stroke in 3 phases. You can also clearly see the technique of this player: his elbow is very close to the body. He lowers his center of the gravity, and use the waist to generate the power. You can also practice the “precision” by focusing the moment you hit the ball. Prepare well before hitting is the key to avoid missing the ball. The weight transfer between the left and right foot is also very important. You should memorize this mechanism because it’s fundamental in table tennis. To improve your table tennis techniques, you should repeat the training every day. Repetition is the only way to change your bad habit, to correct your stroke. I recommend you compare this technique with your videos, you will clearly see a huge difference. You hit with only one phase without “acceleration”, and this Chinese guy hit with 3 phases. Don’t need a table, you can improve the timing. Better timing always reduce unforced error in your table tennis. Improve the physical strength of your legs and your hips. Because “Power From the Ground” is fundamental in table tennis. There are 3 types of devices that you can buy to train at home. Each device is designed to a specific exercise. Read the guide to buy the training tools here. The idea was to develop training equipment that would facilitate “rallies” in table tennis. A played ball should be returned to the player. This ball should not only come once – but – when played in a controlled manner, come back to the player several times. This could be a “single-player ball rallies” train, which allows a challenging topspin training. Yes, I really like the Return Board. If you don’t have any partner, the Return Board is your best friend.